1 Prepare Knorr® Rice Sides™ - Cheddar Broccoli according to package directions. Evenly spread on baking sheet and cool slightly. Stir in bacon and cheddar cheese; shape into 1-1/2 inch balls. 2 Arrange flour, eggs and bread crumbs into 3 separate shallow dishes. 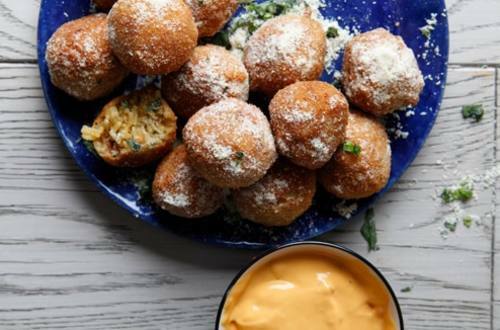 Gently coat risotto balls in flour, egg, then bread crumbs. 3 Heat oil in large nonstick skillet over medium heat and cook risotto balls, in batches, turning frequently, until golden brown, about 1 minute. 4 Serve, if desired, with Cheddar Cheese Dipping Sauce*.